ITIL Manifesto - was muss sich bei ITIL ändern? Nutzer sind trotz ITIL unzufrieden – ITIL Projekte scheitern. Was geändert werden muss, wird unter #ITILManifesto aktuell diskutiert. Eine Wertediskussion. Vor einigen Wochen stolperte ich bei Twitter über den Hastag #ITILManifesto. 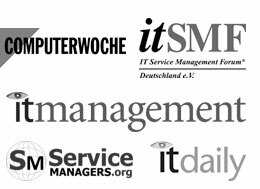 Es war eine interessante Diskussion über die Werte im Bereich ITIL / ITSM zu lesen. Mir Bekannte und Unbekannte diskutierten darüber, was wirklich wichtig ist. Die ganzen Ideen wurden gesammelt und auf tricider zu Abstimmung gestellt. Das Ergebnis dieser ersten Phase findet Ihr im ITIL Manifesto Wiki. Den Teilnehmer am wichtigsten ist folgender Satz: “Prioritise outcomes that affect customers over internal IT metrics” – in Deutsch: Ergebnisse, die Auswirkungen auf den Kunden haben, sind wichtiger als die internen IT-Metriken. Mit diesem Satz zeichnet sich das Problem und der Weg gut ab: Nicht die Einhaltung der IT-orientierten Metriken und perfekte Prozesse sind das Ziel, sondern zufriedene Nutzer und Kunden. Etwas weitergefasst: Der Fokus auf das Business des Unternehmens. Mehr zu diesem Thema hört Ihr in der zweiten Folge des IT-Management-Podcast. I joined a conversation on twitter (see below) which was talking about the problem of having to remember the core principles of ITIL in the context of an Agile manifesto. So whilst I suggested ITIL Manifesto, I’m pretty sure someone else in the thread would have pretty quickly anyway, so I just voiced what everyone was thinking about. It started there and within 24 hours we’d gone from twitter to a google doc to tricider.com (incidentally a very useful platform). 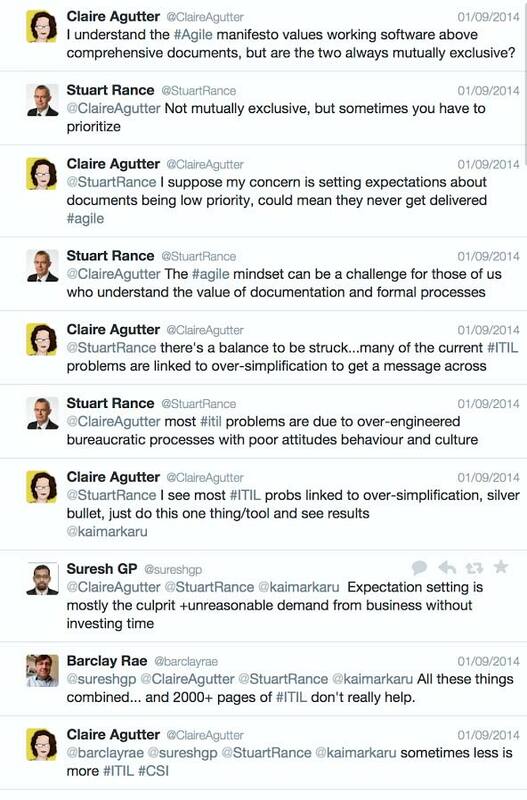 Incidentally – I’ve just realized that on the podcast recording I claimed credit for making the leap between agile and ITIL manifestos but clearly it was Claire – sorry Claire! My intention is to encourage other people to have the discussion, and to hear as many fresh voices as possible. There are some well known authoritative voices in the ITSM scene, certainly in the UK and whilst they’ve contributed freely and passionately (and will no doubt happily continue to do so), I think they’re also very respectful of the fact that other people need a voice too – even those who may be new to ITIL or not really ‘IT professionals’ but still get involved with ITSM – as customers, clients, users. So I think we’re heading towards a nice mix now – the authoritative experts and some newer voices. As for me, I’m happy coordinating, agitating, occasionally suggesting and I’m learning a lot as I go too. Are you aware of SMCongress? How will ITIL Manifesto differ from the Call-to-Action from SMcongress? I had forgotten about SM Congress until someone mentioned it in context of the ITIL manifesto. I wasn’t really around on the ITSM social media scene when it happened so I only know what I’ve read about since then. If people did feel disenfranchised by SM Congress, then ITIL Manifesto is an opportunity for them to re-engage with a discussion on ITIL values. Coming back to your question I think that there are obvious overlaps in content, although there are differences in approach. Where SM Congress was restricted to certain people (and I’m not judging the organisers here – if I was given the same brief I may have done things the same way), ITIL Manifesto is open to everyone. ITIL Manifesto also has a particular emphasis on practicality. One thing I would disagree on is the focus on the ITIL framework. Why do you focus on ITIL and not on ITSM itself? I think there are also problems with “implementation” of COBIT and other frameworks in the ITSM space. I get your point. The ITIL/ITSM question has been raised and voted on (5-2 in favour of ITIL). The big advantage of ITIL is the commercial backing if we get it right (and I think we’d have to do something seriously wrong not to get it right). That may happen too with an ITSM Manifesto, but I personally think it will be quicker with ITIL. One of the problems identified was the fact that there are 2000 pages over 5 books of ITIL and we need something simpler that can be communicated quickly from a position of best practice pragmatism rather than theoretical fanaticism. I’ve been there in meetings with clients when someone with a grudge against ITIL or any kind of governance has used a straw-man argument about complex processes or excessive KPIs and it would be nice to answer from that (for example) the ITIL manifesto endorses customer value over complicated SLAs – or similar. I’m not as familiar with COBIT so wouldn’t feel comfortable answering, but I think the open and inclusive nature of ITIL manifesto and our intention to (and act of) make all the data available means that if related fields want to use it, they’re welcome to. I’m still researching Creative Commons licensing following a suggestion from James Finister and hope to have a definitive answer on that soon. Are there any relations to Axelos? AXELOS have been great. They gave us their blessing, helped promote it and then stayed out of our way. I literally couldn’t ask for more.They have every right to not use what we come up with of course, but I think they and especially Kaimar are keen to let the communities have their say. I’m not egotistical enough to think that the ITIL Manifesto will be the centre of the ITIL universe but I think it could have a healthy and positive influence on ITIL moving forwards which is why it’s vital we get as many people as possible involved. Ideas are gathered and a couple of people have voted for them. Are you satisfied with the involvement from the community? I’d say it’s more than a couple! We’ve had 220 votes on 106 ideas from 928 unique visitors. It’s a great start. Am I satisfied? I will only be satisfied when everyone who has ever heard of ITIL or ITSM has suggested, discussed, argued and voted. Since this is unlikely to happen, then I’ll keep plugging this initiative until people start unfollowing me on twitter and we’ll do the best we can. We’re trying to make community engagement as easy as possible, but one of the biggest challenges facing us now is how to get lots of people all working on the same thing without confusing the heck out of everyone. People have been really supportive though. Even the ones who are a little mischievous and aren’t terribly big fans of ITIL have still given us food for thought. We’ve nearly finished grouping the first round of ideas into themes. Next we’ll analyse for gaps, to see which themes are missing and where we need to go back out and ask for more ideas. We’ll also then start distilling and crafting principles which encapsulate the grouped ideas and then work out how to rationalise these. One thing I’d really like to do in addition to what we’re doing is let people just take the raw data away and do their own thing with it (using the Creative Commons license I mentioned earlier). There’s every chance someone somewhere in the world will come up with something utterly brilliant we never thought of. Secretly, I hope this happens!Once a manifesto has been published, that is of course only version 1. To get involved, check out the wiki and add your name to the mailing list which can be found under the ‘how to contribute’ page. I’ll use that to mailshot the active contributors when we need specific things doing. Im Moment werden Beziehungen zwischen den einzelnen 106 Ideen gesucht, um diese zu strukturieren. Jeder kann und soll sich mit einbringen. Informationen dazu im Wiki. Einen Auszug aus dem Interview hörst Du im IT-Management-Podcast.